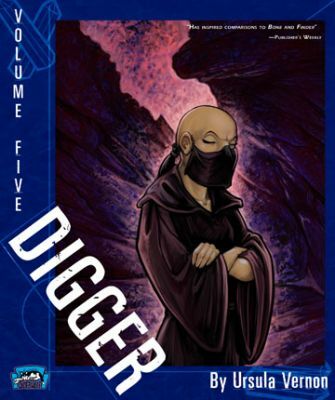 In this fifth volume of Digger, covering chapters nine and ten of Ursula Vernon's webcomic, our wombat heroine embarks on the journey into which she had been cajoled by the statue of Ganesh in the previous volume, accompanying Murai and her destiny towards a monastery in the Morrakgon Mountains that once had connections to the god shackled underground. Along the way, they meet up with Grim Eyes, who had been sent to join them by Boneclaw Mother, hire a guide with an interesting history (and morphology) all his own, and are surprised to find that Shadowchild has been trailing them all along. One of the oracular slug's prophesies comes true, with disastrous consequences that threaten to end their quest rather abruptly, but with a good dose of teamwork, wombat-style glow-sticks, and Grim Eyes' first-aid skills, they manage to resume their trek. Unfortunately, when they arrive at the monastery, they find it to be rather less inhabited than they had hoped, though not completely empty. Murai's destiny is interrupted by the arrival of one of Digger's relatives, from whom they learn the history behind the god who is chained underground. Their path forward becomes clear, but before they can return to the temple, Shadowchild gets a visit from a relative of his own, and for him the phrase "confronting your demons" takes on a whole new meaning.